An astronomer uses an odd type of telescope in this 18th-century illustration. The telescope was created by mounting its glass lens on a small platform attached to the side of a tall pole. The eyepiece was on the ground, linked to the lens by a long wire. When the wire was pulled taut, the lens and eyepiece aligned. The largest of these used a maypole from a London neighborhood. 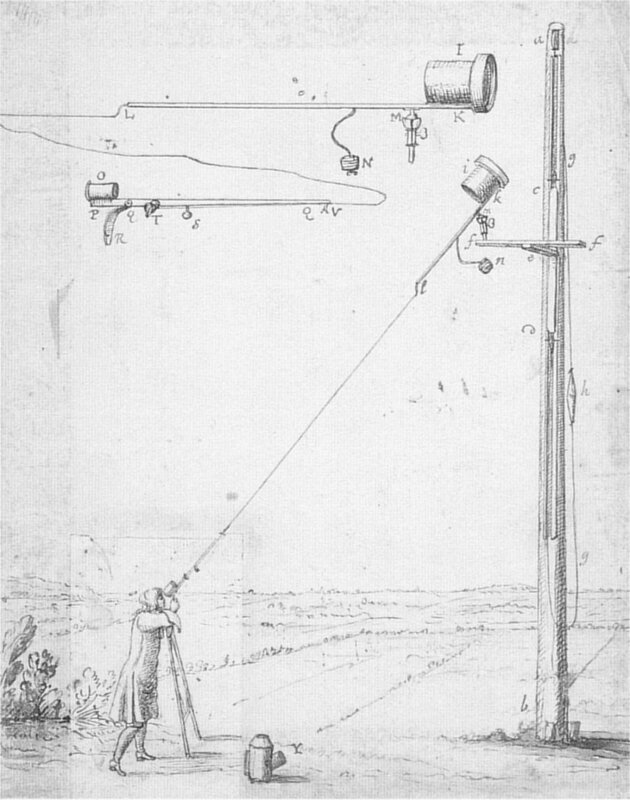 Isaac Newton purchased the tall maypole and, in April 1718, had it moved to a park outside the city. James Pound, a clergyman and astronomer, used a large lens on loan from the Royal Society to create the telescope. Newton used some of Pound's observations with the telescope to calculate the orbits of the moons of Jupiter and Saturn.